An altogether new dimension-religious sanction-was added to the institution of slavery with the rise of Christianity to power in the Roman Empire. Hitherto, slavery had been a creation of the crude in human nature the urge to dominate over others, to make use of others for private comfort and profit. Now it was ordained that the God of the Christians had bestowed the whole earth and all its wealth on the believers, that the infidels had no natural or human rights, and that the believers could do to the infidels whatever they chose-kill them, plunder them, reduce them to the status of slaves or non-citizens. In short, slavery became a divinely ordained institution. With the advent of Islam, slavery became inalienable with religion and culture and was accorded a permanent place in society. It goes to the credit of Islam to create slave trade on a large scale, and run it for profit like any other business. 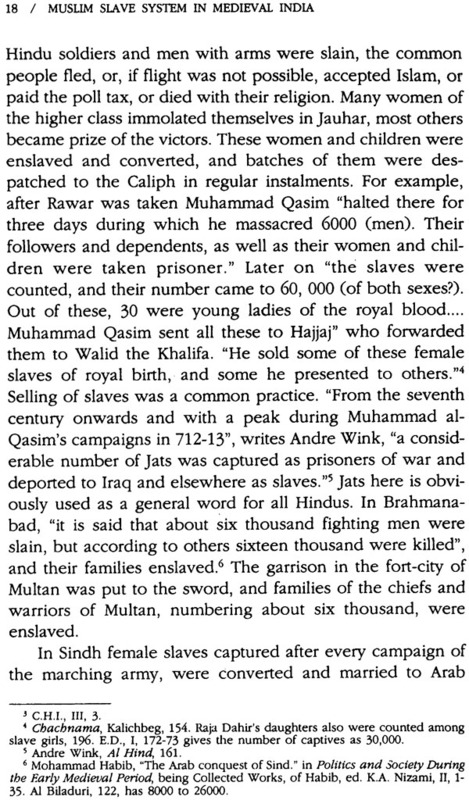 Prophet Muhammad had not only accepted the prevailing Arab practice of making slaves but also set a precedent when he sold some Jewish women and children of Medina in exchange for horses and arms. War was prescribed on religious grounds, and became an integral part of Islam. 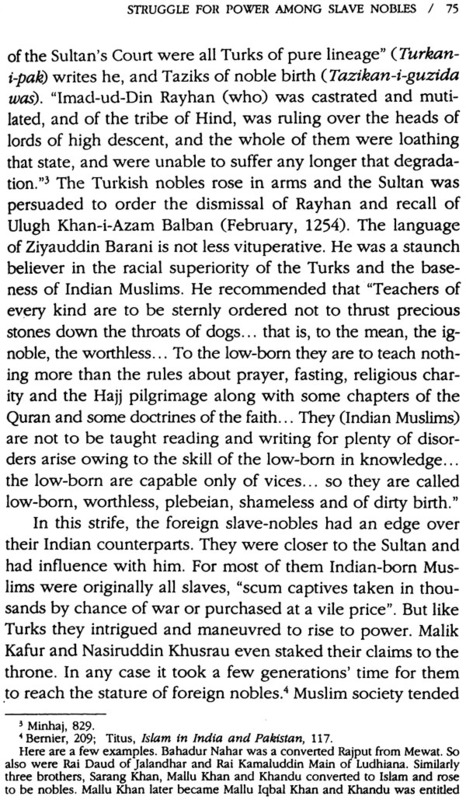 The Quran expressly permitted the Muslims to acquire slaves through conquest. 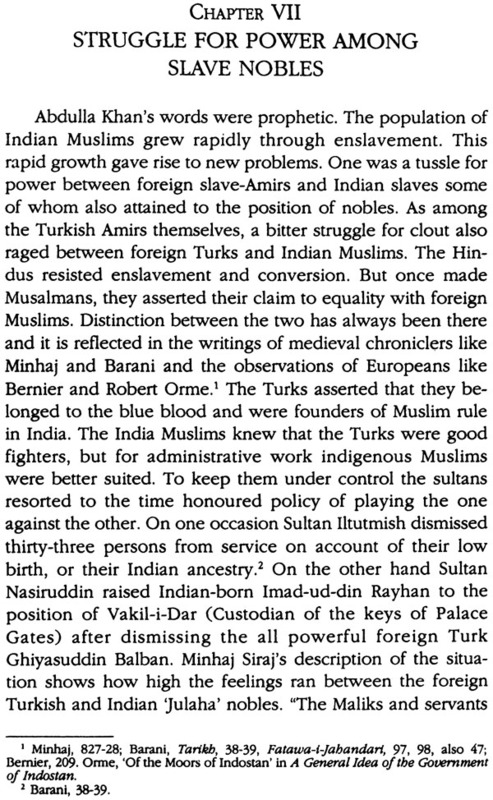 From the day India became a target of Muslim invaders its people began to be enslaved in droves to be sold in foreign lands or employed in various capacities on menial and not-so-menial jobs within the country. 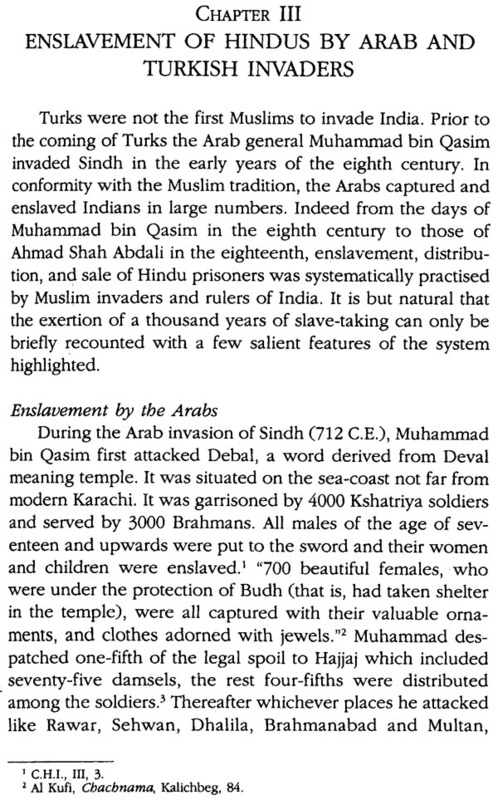 Indeed, from the days of Muhammad bin Qasim in the eighth century to those of Ahmad Shah Abdali in the eighteenth, enslavement, distribution, and sale of Hindu prisoners was systematically practised by Muslim invaders and rulers of India. 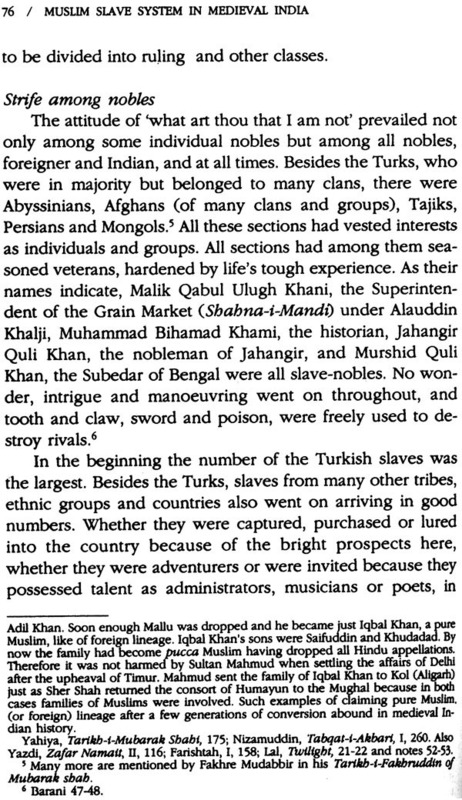 Right from the fifteenth century Muslims would go on furnishing black slaves to European slave traders. 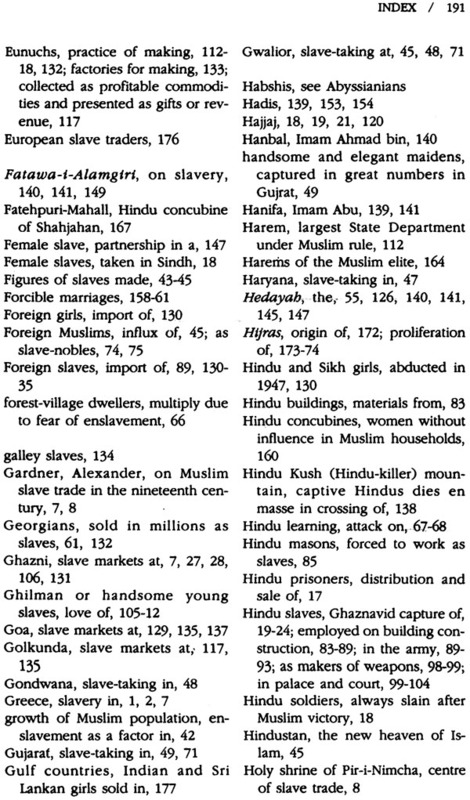 At least 80Ck of all the black slaves that were ever exported from Black Africa, went through Muslim hands. A large part of the slaves transported to America had also been bought from Muslim slave - catchers. The present study by Professor K.S. 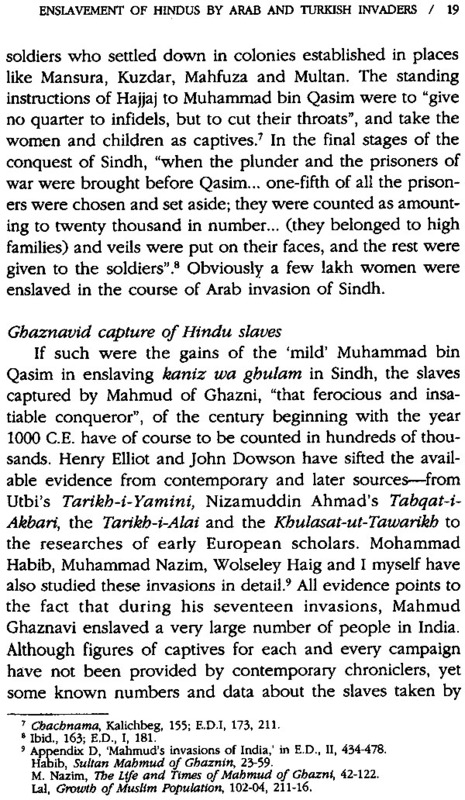 Lal documents for the first time the Muslim slave system as it obtained in medieval India under Muslim rule. Slavery is the system by which certain persons are kept as the property of others - a system of great antiquity and wide prevalence. Slavery originated during the age of savagery and continued into ancient civilizations. As Nieboer has said, "the taming of animals naturally leads to taming of men." It is supposed that the nomadic herdsman who domesticated animals also began to domesticate, to enslave, men. Slavery was there in Babylon and elsewhere in Mesopotamia; it was widely prevalent in ancient Egypt, Greece and Rome, centuries before the coming of Christ. Slaves were mainly prisoners of war, but destitutes, debtors and convicted criminals were also sometimes drafted' into slavery and commandeered for specific assignments. The history of ancient civilizations in various countries is divided into dynasties, periods and kingdoms. We need not go into details of these; for our limited purpose we shall only attempt a general survey of the state of slavery in ancient Egypt, Greece, Rome etc. 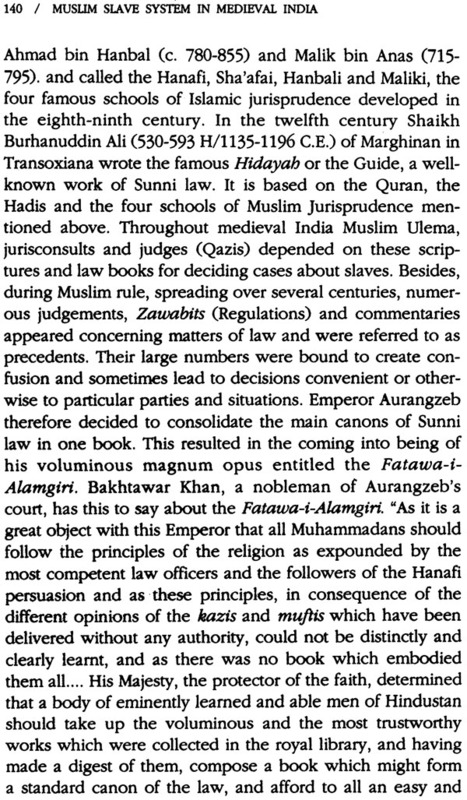 till the advent of Islam when slavery became inalienable with religion and culture and was accorded a permanent place in society. In ancient Egypt, as elsewhere, slaves supplied the labour force and were used in any capacity and for any type of work. An almost fabulous number of slaves were employed for the building the Pyramids of Egypt dating from 3000 B.C. to 2300 B.C. "According to Herodotus, the Great Pyramid (of Cheops) took 100,000 men for ten years to make a causeway 3000 feet long in order to facilitate the transport of stone from the quarries, and the same number of men for twenty years more to complete the pyramid itself." Modern research considers these figures to be exaggerated as Herodotus inquired from people during his journeys and depended on hearsay. What is important in this regard is that the nine pyramids existing at present, are supposed to have been built by respective kings as tombs and memorials of themselves by a very substantial labour force. Slaves in Egypt were also employed on various other jobs. Among the Greeks also slavery was a rooted institution. In two city states or poleis (singular polis means a city plus its environment) of Athens and Sparta slavery prevailed as also in other lesser known city states. Ancient Greek society was divided into three classes. The free- borncomprised the citizens. They enjoyed all kinds of privileges and took part in politics. The second class of perioeci consisted of foreigners. They possessed no political rights, but they were better off as compared to slaves because sometimes they handled economic affairs and enrolled in the infantry. The third category of helots comprised of slaves. In Greece the bulk of the peasants did not own their own land and had to supply a considerable portion of their crop to the landlords. They fell into debt and ultimately had no security to offer but their own persons. They were then sold into slavery. It is said about Athens that at one point of time there were 460,000 slaves and 2,100 citizens. Consequently, each master had a number of male and female slaves. The men worked in mines and on cultivation while women slaves worked as maids in homes. They were required to do all those works which provided leisure to the masters. Earlier among the Hebrews and later among the Greeks the slaves were treated with mildness, but not in every city state. At Athens the slaves were treated with mildness while in Sparta they are said to have been accorded very harsh treatment. By themselves the slaves were helpless, but the Constitution of Draco (621 B.C.) and laws of Solon ameliorated their condition.' They were the property of the state; they possessed certain elementary rights, and could not be put to death save by the authority of the state. However, the larger number of slaves in Greece left the privileged classes enough time to give to politics and development of political philosophy for which ancient Greece has become famous. In Rome also slavery was extensively prevalent. There the great landed estates were accumulated in a few hands and the cultivation of these lands was done mostly by swarms of slaves leaving war as the chief occupation of honour for the elitist citizens. Roman slaves were either captives or debtors who were unable to repay. There were purchased slaves also. In Rome the slaves had no rights at all; they could be put to death for the smallest misdemeanor. The slaves were so numerous that, in the time of Augustus, a single person is said to have left at his death over 4000 slaves. Besides cultivation the slaves were engaged in all the various professions, handicrafts and occupations. Supervision of the large number of slaves employed on cultivation was not easy. Consequently, they were chained with iron shackles. The iron rings on their wrists and ankles were not removed even when they went to sleep. Hosts of slaves were employed in the sport of gladiatorial exhibitions. Gladiators were combatants who were obliged to fight wild animals or each other, often to the death, for the entertainment of the spectators. Some slaves were trained as regular gladiators. In the public exhibition, if a vanquished gladiator was not killed in the combat, his fate was decided by the spectators. If they wished his death [or showing weakness or disinterestedness in the fighting, they held up their thumbs; the opposite motion was to save him. It was a cruel enjoyment at the cost of the helpless slaves. There were sometimes slave revolts also. A revolt in Italy led by the gladiator Spartacus in 73 B.C. could be put down with considerable difficulty. Slaves, however, were sometimes set at liberty, and these freed-men were a well-known class at Rome. In the days of the Roman empire some great changes took place in the condition of the slaves. Augustus Ceasar (63 B.C-14 C.E) granted the slaves a legal status and Antoninus Pius (86-161 C.E) took away from the masters the power of life and death. Emperor Constantine (C.E. 274-337) made it a rule that in case of the division of property of a master, the distribution of his slaves be so arranged that father and son, husband and wife and brothers and sisters should not be separated. Galley slaves were also common in ancient Greece, Rome and especially France. They propelled ships or warships with oars. Small galleys carried as many as twenty oars on each side, each of them worked by one or more men; the large ones had 200 to 300 rowers on each side. In this work convicts or slaves were forced to labour. The slaves were sometimes chained to the deck and lashed with whip if found slack in work. The cruelties sometimes perpetrated by their masters have become proverbial in the annals of ancient European maritime activity. 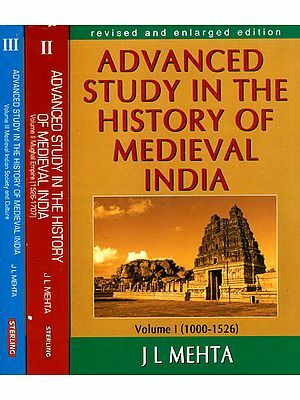 As in most parts of the ancient world, slavery seems to have been a recognised institution of ancient Indian society also from the earliest times. 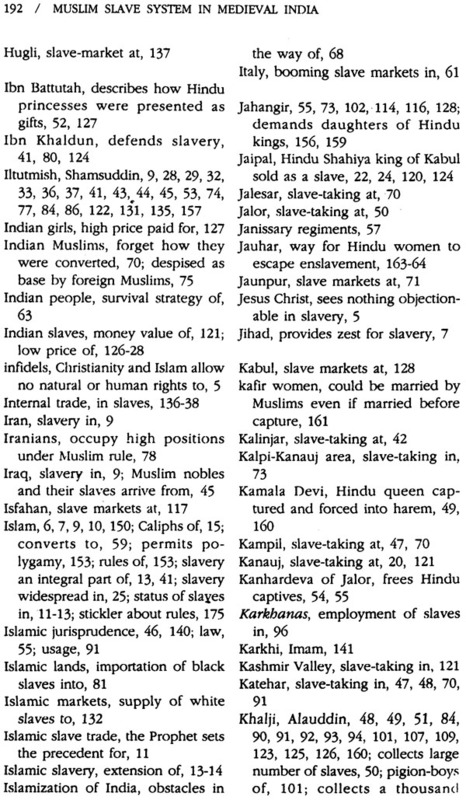 In the Rigveda there are many references about slaves. Slaves were given as presents to relatives. 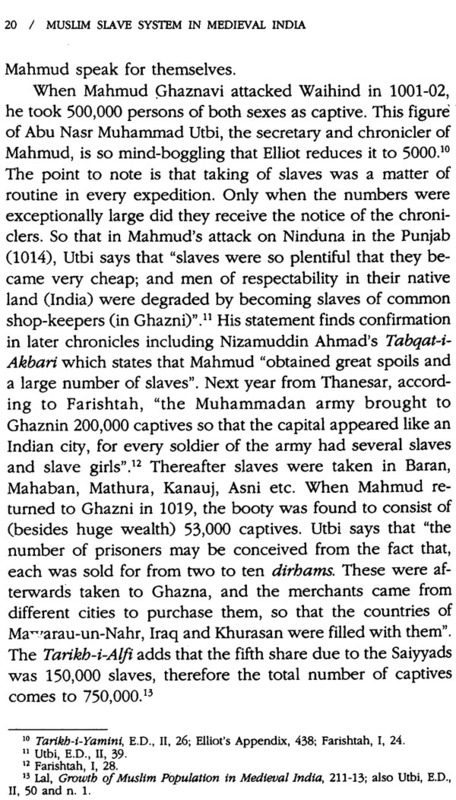 Rulers gave female slaves as gifts. All these slaves served as domestic servants in the palaces of rulers as well as in the establishments of aristocrats and priests. Probably all those persons who could not repay their debts were reduced to slavery. In ancient Indian society slaves were treated with consideration. Their condition was far better as compared to that of the slaves in ancient Egypt, Greece, and Rome. The Buddha enjoined on his lay followers to assign only as much work to their slaves as they could easily do. He also said that the master should attend to the needs of his slaves when the latter was ill. During the Maurya period Cc. 300 B.C. to 100 B.C. ), Kautilya laid down rules about how slaves should be treated by their masters. The master was not to punish a slave without reason. If a master ill-treated his slaves the state was to punish him. Emperor Ashoka says in his Rock Edict IX that all people should treat their slaves with sympathy and consideration. In ancient India slaves were so mildly treated that foreign visitors like Megasthenes, who were acquainted with their fate in other countries, failed to notice the existence of slavery in this country. He wrote, "All Indians are free. None of them is a slave .... They do not reduce even foreigners to slavery. There is thus no question of their reducing their own countrymen to slavery.'? Megasthenes of course could not speak for the whole of India and for the entire ancient period. Slavery did exist in India, but it was tempered with humanism. 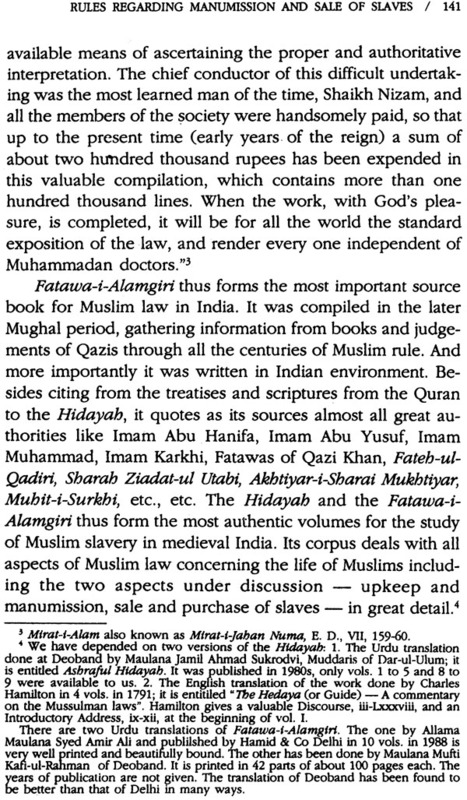 There are philosophical and religious works in ancient India from the Rigveda onwards which do write about slaves. But none of them suggests that they were cruelly treated. In India slaves were not treated as commodities for earning profit through sale. Indian economy was not based on slavery. 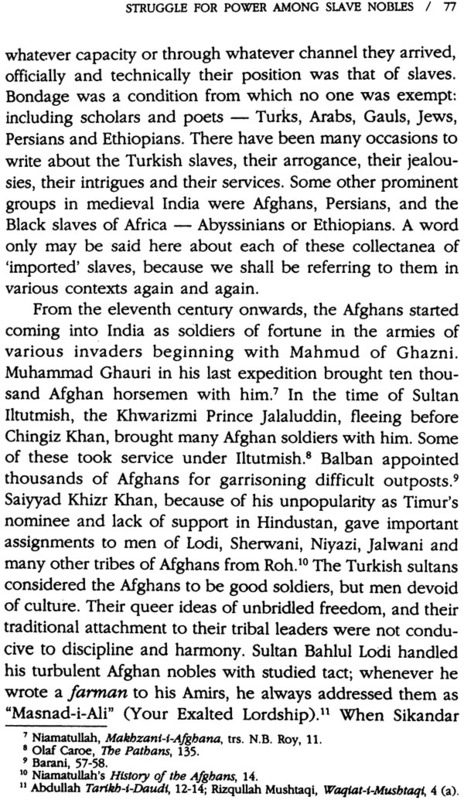 The number of slaves in ancient India was less than that in western countries and, aberrations apart, they were treated with kindness and as human beings. An altogether new dimension - religious sanction - was added to the institution of slavery with the rise of Christianity to power in the Roman Empire. Hitherto, slavery had been a creation of the crude in human nature - the urge to dominate over others, to make use of others for private comfort and profit. Now it was ordained that the God of the Christians had bestowed the whole earth and all its wealth on the believers, that the infidels had no natural or human rights, and that the believers could do to the infidels whatever they chose - kill them, plunder them, reduce them to the status of slaves or non-citizens. In short, slavery became a divinely ordained institution.